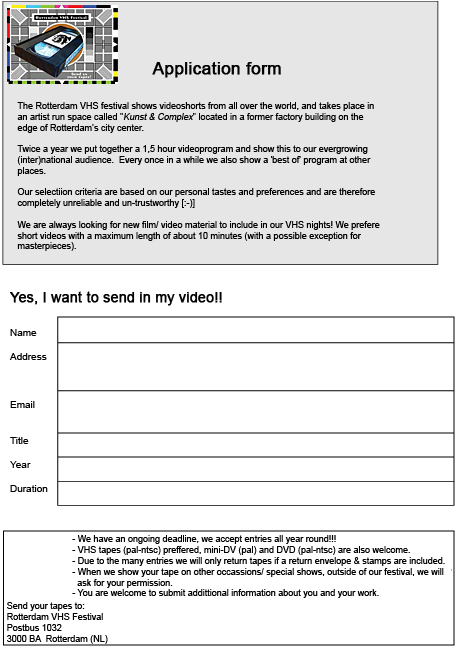 The Rotterdam VHS festival shows videoshorts from all over the world, and takes place in an artist run space called "Kunst & Complex" located in a former factory building on the edge of Rotterdam�s city center. We are always looking for new film/video material to include in our VHS nights! WARNING! Our selection criteria are based on our personal tastes and preferences and are therefore completely unreliable and un-trustworthy :-). We prefer short films with a maximum length of about 10 minutes (with a possible exception for masterpieces). We are also very interested to meet other programmers/curators/artists to increase overseas interaction.